Brandlin: Twilight Scenery VI - WIN A KIT! Twilight Scenery VI - WIN A KIT! Ok, so its not THAT impressive, but you'd get my gratitude too! Some of you may have been following my blatherings about laser cutting as a means of producing model kits, first for sci-fi vehicles and more recently for scenery. Particularly scenery for the World of Twilight game, available from Hasslefree Miniatures. Although these kits are designed to match the style of the Twilight game, they should be suitable for any medieval fantasy setting that likes something a little 'quirky'. I'm impatiently waiting for the first trial of scenery kits to be sent back from the laser cutter (Fenris Games). This will be the Pryn-Gul Tower and the Tew-Fah bridge. which can be seen in earlier blog posts. 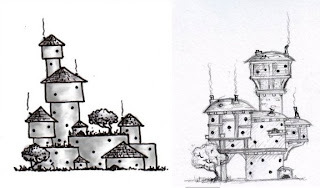 The original idea for this range of scenery for the Twilight Game was to have flat packed kits made from laser cut plasticard which could either be assembled alone (like the Tew-Fah bridge) or combined with a common household item - the Pryn-Gul Tower is based on a Pringles tube. By using items such as the Pringles tube, I hoped to keep the cost of the models down and also to keep the A4-sized flat-packed nature and keep postal costs to a minimum. The Pringles tube is ideal but I have been unable to come up with other items which would be suitable. To match the style of architecture for the Twilight game and to meet my modeling requirements the items would need to be. Cylindrical - A consistent size somewhere between 50mm and 250mm in diameter and above 50mm in height. Maximum height around 300mm or easy to cut accurately. A slight taper to the cylinder is acceptable. Cardboard or plastic - plastic should not be of the polyethylene type that even repels superglue, if the plastic feels 'waxy' then its no good. It must be able to be modeled with tools normally available to a war gamer/modeler - ie a scalpel knife, files sand paper clippers. Widely available - like the Pringles tube it should be easy to get hold from local supermarkets or other outlets. I'm based in the UK so am initially looking for items available here, though the Pringles Tube is a world wide constant it seems. Cheap - again, like the Pringles tube this should either be a container which can be reused or an item that costs no more than £2 to buy. I've considered drain pipes and such like but the problem is most people would have to buy a 6 foot length (or more) in order to get just a few inches, or I'd have to cut and ship it which removes the flat-pack nature. Recyclable - Household paint tins have been suggested but the work necessary to clean them up so they could be used for modeling is excessive. There has been debate about this over on the Forum of Doom, and a number of suggestions made but none of them have quite hit the mark, household paint tins, GW spray cans, various food stuff containers, CD spindle covers, foodstuff tins etc. The only possibles so far are mini pringle tubes (why would anyone want to buy fewer Pringles? 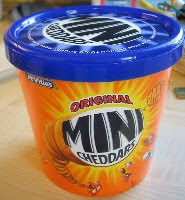 ), Bisto Gravy Granule tubs, and Mini Cheddar / Twiglet Tubs. Unfortunately the latter are only available at Christmas!! So the hunt is on for suitable components for my next building. All suggestions welcome and if I pick yours then you WIN a FREE copy of the kit when completed. Please be as specific as possible! Leave your suggestions in the comments below. Thank You. You might want to consider individual yogurt containers, such as those marketed by Yoplait (at least here in the US). I used some to build a fort for a Colonial game last year ( colcampbellbarracks.blogspot.com/2009/05/building-fort-at-khalam-part-1.html ). Hi ColCampbell50 and thanks for the suggestion. I like what you did with your fort. I've had mixed success with yoghurt pots as the material is often very difficult to glue to styrene. The tubs are also partially conical which causes problems for assembling things to the face. I'd have to find a particular tub size and brand that is available widely too. Not insurmountable so i'll keep the idea in mind. Thank you. Rather than depending that some random bit of packaging is consistent everywhere, why not include some structural pieces and .005" or .010" plastic sheet cut to the right shape to wrap around those pieces to create your round shapes. This way you know exactly what shape the tower is and how the pieces will fit on it. Hi Bill, and thanks for the suggestion. However I've considered exactly this. To make a tube the size of the Pringle tube will take 2 further sheets of A4 styrene, one to form the circumference and a thicker sheet to make a number of circular braces inside the tube. This adds significantly to the cost of the kit as it doubles the amount of materials. In order to bend plastic sheet like this you need to go down to thicknesses in the order of 0.25mm and even then the edges where the tube meets are impossible to get smooth - the natural elasticity of the material causes a bump. Thinner material is better, but also not very strong to mount other components to. Finally although the laser cutting machine is extremely accurate the way styrene cuts is actually by melting away from the laser - this means that the cut pieces are only accurate to around +/-0.1mm. This may not sound like a problem but when you are trying to accurately create a circumference its enough to provide gaps and overlaps of up to 1mm which just makes the tube much less accurate. In all the tests I did i couldn't recreate a Pringles Tube sized cylinder as accurately as a Pringles Tube, nor as cheaply as buying the Pringles. Besides I think the "turn your household stuff into terrain - just add this kit" is a fairly good selling point!